Second edition of this fair, not a usual one, as Handmade Christmas revives the true Christmas spirit by donating the funds to children in difficulty. The organizer, AITC – The Association for Therapeutical Intervention in Crisis, will help the children from Mia’s Children, a foundation dealing with children from families in difficulty. Fashion addicts, handmade lovers and all of you that would like to give a chance for an additional smile to all these children are welcomed to choose their Christmas present this Sunday! Big hearted handmade artists will be there, supporting the children from Mia’s Children, side by side: Pumpkin Design, Handmade Shic, Gablontz Ro, Cristina Ion, Ioana Georgiana Caravan, Handmade Bijoux, Accesorii din Hârtie, Sorina Porfireanu, Pandora Handmade, Madds Shop, Oana Stoica, Para Desfrutar, Gina Moise, Accesorii Pompoase, Angela Ciuperca, Laura Ciuciuc, By Kodreenah, Ensoillement Bijoux. See U there and Merry Handmade Christmas! 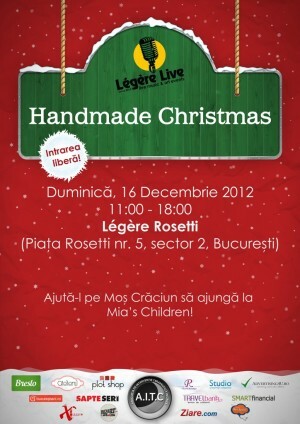 "Handmade Christmas Fair with a Twist" Fair in Bucharest. You can get here description, reviews, address, time and details of "Handmade Christmas Fair with a Twist" Fair in Bucharest. Visit Bucharest Tips for more Fair events in Bucharest!